Michael: Here's the basic B min pattern we will build on. 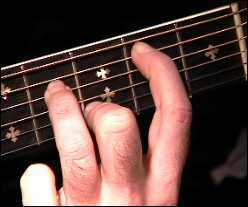 Michael: The video will show you the basic picking pattern, first, here's the B min chord, the second chord you lift your first finger. 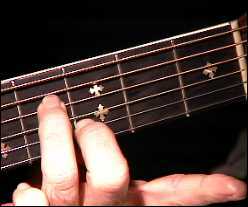 Michael: Notice how the notes play open positions on the 5th and 1st strings. 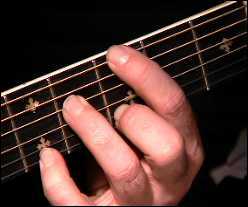 Here's a looping jam track you can play over. 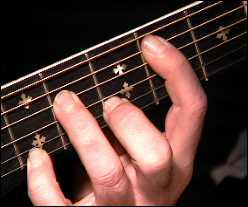 Michael: OK, let's get into some other patterns, this next pattern uses the Bm7 chord. Michael: Now let's take the last pattern and make a subtle change. 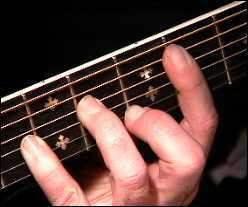 Michael: Notice you have more open string notes, here's the fingerings. 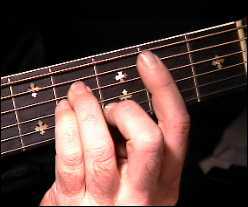 Michael: Now you can add your 4th finger on the 5th fret/1st sting, this adds to the min7 chord. Michael: There are a few subtle, but simple alterations that you can make. 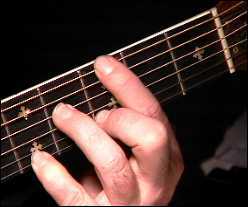 Michael: Notice I just move the first finger to the higher strings, which allows you to use the open A (5th). 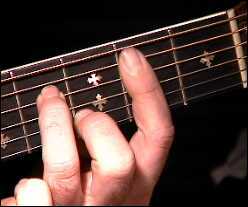 Think of how many combinations you can come up on your own just with these chords. 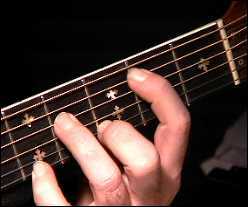 This is a great exercise to help you write your own songs! 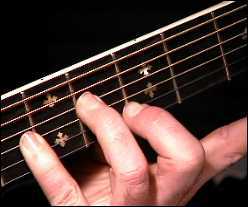 Now it's time for a challenge, this next chord sequence uses the Bm add9 chord, check out the fingerings. Michael: This will make your fingers ache after awhile. Michael: You bet, take your time on this one. 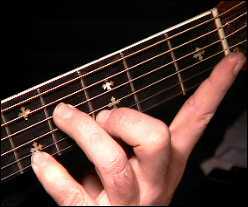 If you have trouble at first, just play the other patterns and keep practicing this one until you can reach the entire chord. 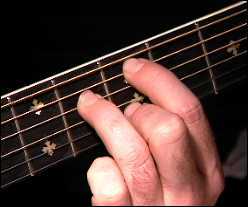 Also make sure the thumb is holding the back of the neck firmly and try adjusting your elbow as well to see if that helps you reach the the chord better. Rhinosaur: Thumb in the middle of the neck, on the back? 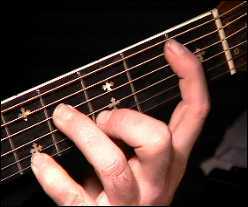 Ginger: LOL, but I can do it an octave higher. Ginger: Thanx teach, or I'll need a glue to permanently implant my pinky. 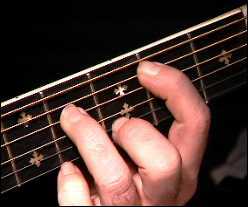 Michael: Now we'll use some of the chords and ascend to other chords. 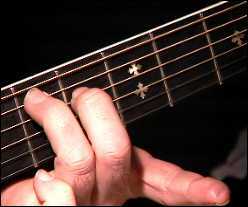 Michael: Notice the Pink Floyd type chord towards the end, it has a D 1, 3 and sus4. 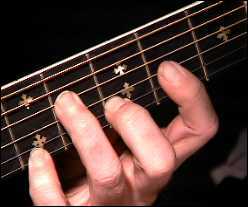 Michael: Notice how the open G string (3rd) rings open throughout all these chords. Michael: Now you can alter that pattern as well, here's another variation. 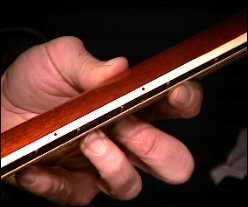 Michael: In this pattern you start with the same chord, the second bass note moves to C. You add your little finger on the 5th fret/1st string and the last note you move your first finger to the G on the 3rd fret/6th string. 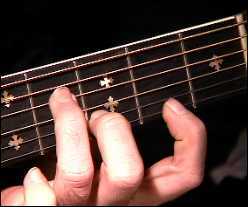 Liza: This sounds awesome on a 12 string! Michael: I bet it does Liza! 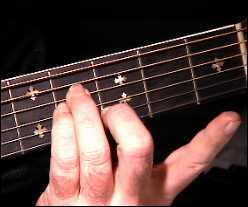 This last pattern is a little tough, you have the same chord structure, but you add a descending bass line. Michael: Well that's it for this lesson. 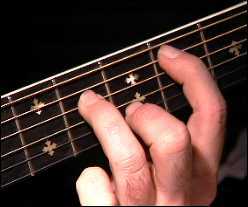 I hope you enjoyed learning these new chords, practice hard everybody, and see you next lesson!